At 6 a.m., it’s pitch black. From the kitchen a low rumbling sound echoes through the house. The coffee beans begin to grind. I finally have the incentive to crawl, albeit slowly, out of bed. Caffeine addiction? Definitely. Delicious substitute for the government’s recommended number of hours of sleep? Absolutely. I usually won’t take the first sips until I get into my seat first period. And when I do, my taste buds appreciate it and, at least temporarily, I’m at ease. Fast forward to 2:10 p.m. Time for caffeine round two. “Drive on!” my friend will say as we hop in my minivan. And drive on I will, all the way to Starbucks. Yes, the baristas know it’s me when I walk in at high-speed. They also know my hot and cold drink orders. I’m not ashamed of these facts. But, my standard order for a cappuccino or iced latte may change. Starbucks has a new size and it’s just big enough to keep this sleep-deprived junior in a constant state of jitter. Well, for all the Floridians and Arizonians reading the Black & White online, I must admit I’m jealous. It must be really cool never to be able to close your eyes. Neat-o! 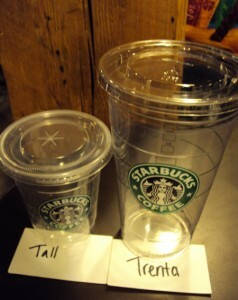 Hopefully, Starbucks will increase the number of cities where they sell the Trenta. Once it hits D.C., each person who successfully drinks this monstrosity of a beverage should be put on a trampoline. Oh, the places they’ll go. Everyone will always be bouncing up and down. Think of what could get done! But, alas. We live in good old Bethesda. Despite all the breaking news stories we publish, nothing that important happens here. Starbucks won’t test a Trenta in our quaint town so we won’t see it here for a long while. Until then, you may just want to increase your tolerance. Start tipping back those Ventis. Haha nice blog, and the video was an awesome addition!